Credit to image used in pin goes to Shappy, Calibre Art, and IPOW. – Changes were made to the original image. When you’re new to certain crafts like sewing, it can feel a bit intimidating. I mean there’s a lot to learn and it’s not always great when you’re working on a project and mess up. However, with the right sewing tools, and learning how to properly use them, you can make sewing so much easier (and enjoyable)! And as you know, I love sharing tips and tricks with you to make your life a bit easier. And that’s why for today I decided to share these sewing tools since I know you were once in my situation. These are tools that are efficient, practical, and save you so much time. So check them out, and if you have any sewing tools you like to use too, let me know in the comments below. I might just add them! If you’re having trouble knowing the precise seam allowance on your sewing machine, then I suggest using a seam measuring gauge. It’s a handy small measuring tool that can quickly and correctly double check your measures. It’s very easy to use and measures 14 commonly used lengths from a ⅛″ to 2″. This handy tool will save you so much time! You could easily get one here ! 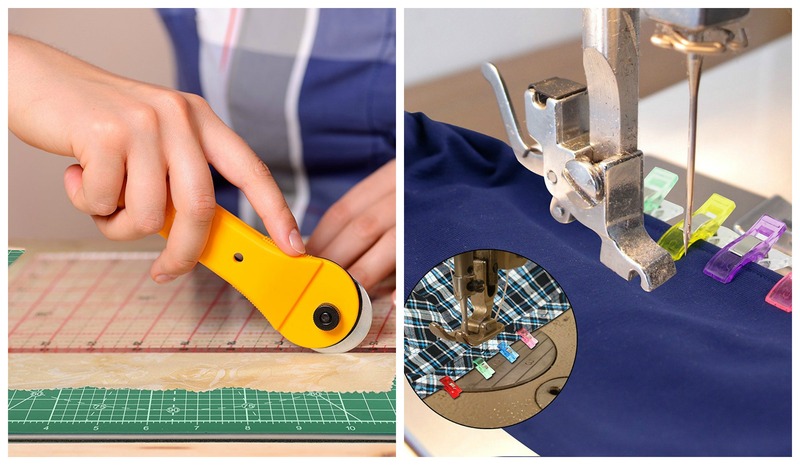 I’m sure you’ll want this rotating cutting mat that’s ideal for cutting and trimming your fabrics quickly. It features 360-degree rotation on a sealed, ball-bearing base, and its mats are squishy, so they hold your fabric in place a little better. Also, it comes with self-healing rotating cutting mats that close up after being cut with a blade. It’s honestly a great way to make sure you have a smooth surface every time you use it. This cute and miniature sewing tool is especially great when you’re pressing corners of tight tote bags, seams in children’s clothing, and small pieces of clothes. It’s a convenient and handy solution that fixes your clothes hard to reach parts and wrinkled area. This is probably one of the best time saving tools for sewing. All you have to is fold your fabric over to the desired hem measurement, and use an iron to press. With its non-slip surface, it’ll hold the fabric in place and give you some great results. Just be sure to keep your fingers away while running the iron so you don’t hurt yourself. You could easily get a hot hemmer here ! Wonder clips are one of the handiest tools you can have for sewing. It holds quilt binding in place while sewing and perfect for layers that are too thick to pin. And if you’re using vinyl or leather garments, it can handle it too! You could easily get binding clips here ! This tool pushes, pokes, pulls, fudges and stuffs effortlessly in fabrics. It’s a great addition to any sewing tool that’ll save you a ton of time. Also, it can be a practical gift idea for your friend or family member who’s a quilter, crafter, or seamstress. You could easily get a purple thang here ! Another little yet helpful sewing tool that I really like is the tracing wheel. It’s a small almost toy-like tool that traces the pattern accurately. It gets patterns of all shapes and sizes perfectly copied from the carbon paper onto the back of your fabric. If you’re doing patterns of different sizes, this is a great way to protect your pattern so you won’t lose the other marked sizes. I think we can all agree that it’s really hard to put thread through the eye of a needle. It seems like it’s the ultimate sewing challenge that you need to pass in order to start stitching. Luckily this tool is especially made to help you out with this. I really like the Sewers Aid since it really is multi-purposed. A drop of it onto your spool, bobbin thread, and other sewing tools will make your machine sewing easier. You might also consider applying it on the bottom of the presser foot and other attachments to glide over fabrics more easily. You could easily get a sewers aid here ! I think this is the most basic and easiest sewing tool that you can find in any store. These fabric pens come in different colors and are a great addition to your sewing kit. It’s easy to use on your fabric when making markings or measurements. It really is a great way to keep things precise! You could easily a fabric pen here ! Sewing isn’t so hard when you have got some handy and practical tools that’ll make your sewing fast. And with these ten sewing tools that I shared with you, I hope they’ll save you a ton of time, make things easier, and lessen the frustration. Now if you have any other sewing tools that you can add to the list, comment them down below. I’d love to hear about them!